Leverage the Popularity of Minecraft with No-Tech 3-D Creations! Kids around the world are enthralled with the video game, Minecraft. While parents may be tired of kids always asking to play, Minecraft is one of the rare exceptions in video games today that has educational value. At first glance the game seems rather simple, but the objective of creating 3-D block structures in an open environment offers kids a creative outlet for exploring, constructing, cooperating with others, and learning how to problem solve through critical thinking. To balance screen time with no-tech play, parents (and educators) can leverage the popularity of Minecraft while continuing to encourage creative thinking, problem-solving skills, and hands-on construction with Wikki Stix! 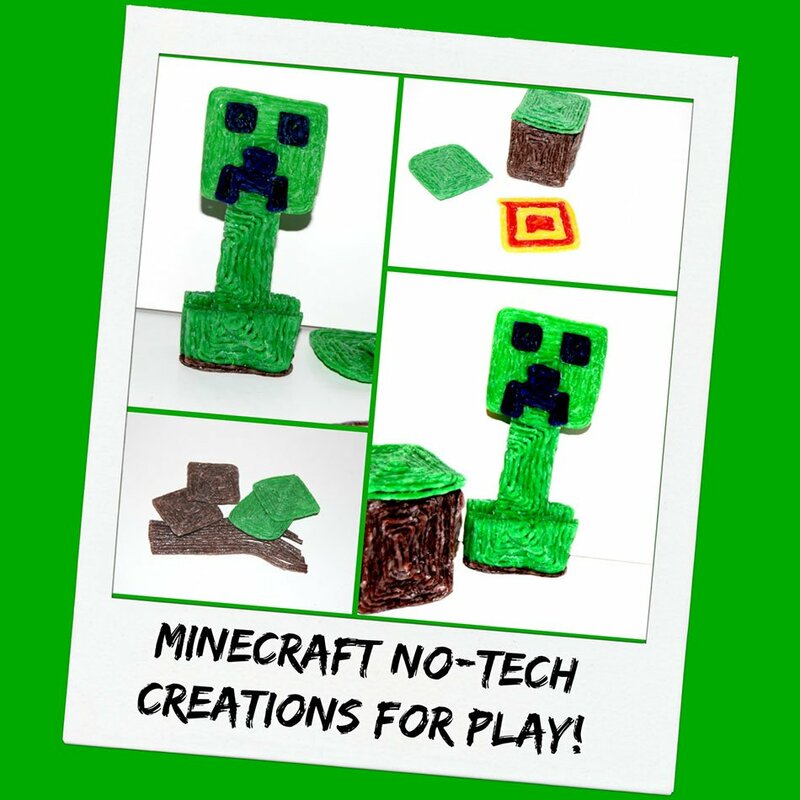 Minecraft No-Tech 3-D Creations for Kids! Set out the supplies on a large tray or table as an invitation for kids to create and play. Minecraft is a block building and construction game. 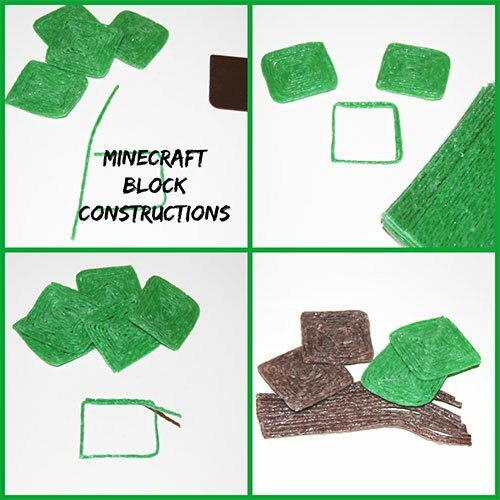 To re-create basic blocks with Wikki Stix, kids can create simple squares filled in with additional Wikki Stix (see Minecraft Block Construction photo). One standard green Wikki Stix will create three sides of a basic square. Use another green Wikki Stix to complete the fourth side (use scissor to cut away the extra Wikki Stix length). Continue adding additional Wikki Stix inside the basic square pattern until the square block is completely filled in. The created Wikki Stix squares can then be used to create 3-D Minecraft block creations. Fold three of the green basic Wikki Stix squares (created above) in half and press firmly. Each half will be used to create the two block “legs” for the Creeper and the body (see Minecraft Creeper Photo for a visual on assembly). 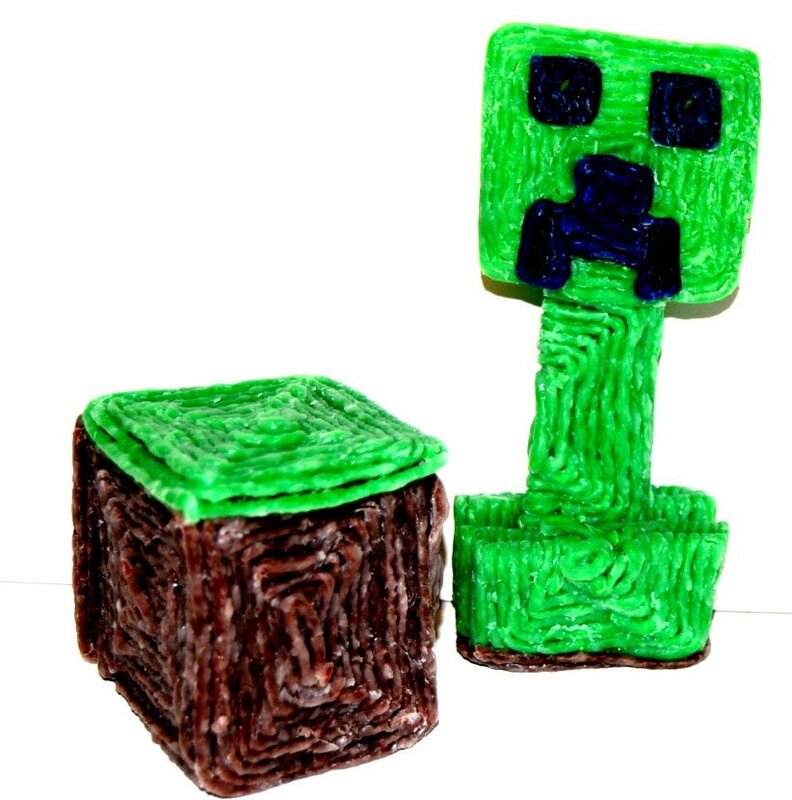 If desired, kids can add two brown Wikki Stix to the bottom of the Creeper’s block legs to more closely resemble the video game character. 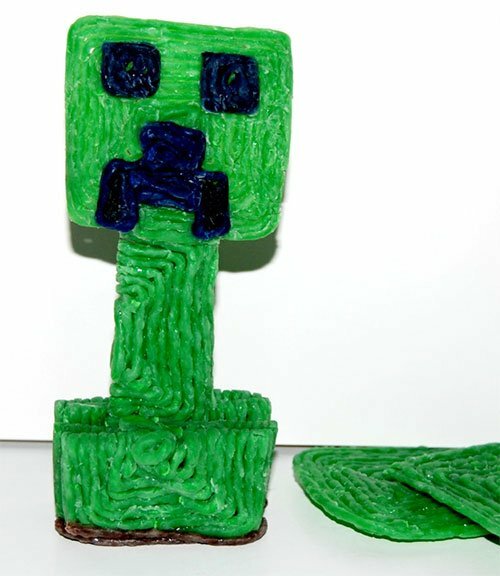 Use a full green Wikki Stix square and attach to the Creeper’s body. Square facial features for the Creeper are created with cut pieces of black Wikki Stix. Kids will often develop their own Creeper designs using the basic Wikki Stix created squares and blocks. Create four basic Wikki Stix squares (per directions above) with brown Wikki Stix. Assemble a 3-D “dirt” block by attaching all four sides together (press the edges firmly together). Place a green Wikki Stix created square on top of the brown sides to form a grass block. 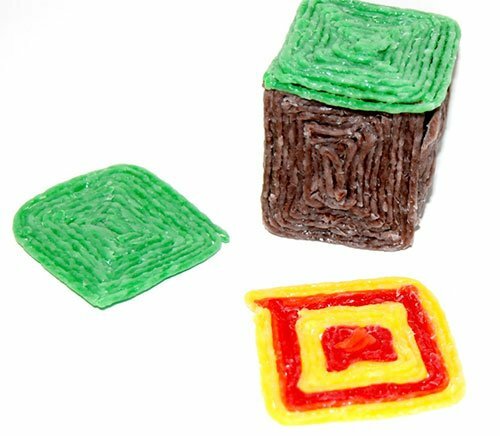 Kids can make as many grass blocks as desired for creating 3-D constructions and buildings with Wikki Stix. Create the basic squares per directions above except use yellow, red, and orange Wikki Stix to resemble the Minecraft magma blocks. Assemble the magma blocks per directions for the grass block creations above. By leveraging kids’ enthusiasm for Minecraft by offering creative opportunities to construct and build outside of the game with Wikki Stix, parents and educators can offer support for the values of designing, creating, and problem-solving in the real world.